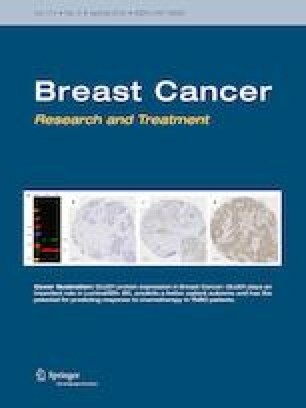 The aim of this study was to compare the difference in disease-free survival (DFS) and overall survival (OS) between invasive lobular carcinoma (ILC) and invasive ductal carcinoma (IDC) in our Hispanic population with breast cancer (BC). We retrospectively analyzed a database of 4533 non-metastatic BC patients treated for BC at the National Cancer Institute in Mexico (INCan) between 2006 and 2016. We compared clinical characteristics, treatment and survival between women with invasive ductal and invasive lobular BC. We evaluated differences between survival curves with the log-rank test and used Cox’s proportional hazards model for the multivariate analysis. Median follow-up time was 42.13 months (IQ25 25.2–IQ75 72.06). The median age was 50.9 years (IQ25 43.5–IQ75 59.8). DFS at 5 years was 80.8% for IDC versus 76.2% for ILC. 5 years OS was 88.7% for IDC versus 84.3% for ILC. Multivariate analysis showed that factors that negatively affected the 5-year DFS include: clinical stage III [hazard ratio (HR) 4.2, 95% CI 3.36–5.35; p < 0.001], triple negative phenotype (HR 1.4, 95% CI 1.08–1.81; p = 0.009), Ki67 ≥ 18 (HR 1.6, 95% CI 1.28–2.11; p < 0.001), and lobular histological type (HR 1.6, 95% CI 1.09–2.49; p = 0.017). Factors associated with a negative impact on OS were: clinical stage III (HR 4.5, 95% CI 3.15–6.54; p < 0.001), triple negative phenotype (HR 2.4, 95% CI 1.69–3.48; p < 0.001), and Ki67 ≥ 18% (HR 1.9, 95% CI 1.27–2.92; p = 0.02). Our results highlight the different biology of ILC and show that long-term prognosis in terms of DFS is not as favorable as previously reported. This study did not received funding. Diana Flores-Díaz, Claudia Arce-Salina, Lourdes Flores-Luna, Nancy Reynoso-Noveron, Fernando Lara-Medina, Enrique Bargallo-Rocha, Victor Pérez and Alejandro Mohar declares that she has no conflict of interest. Dr. Juan Antonio Matus-Santos declares that he has received a Speaker Honorarium from Roche and Pfizer. Dr. Cynthia Villarreal-Garza declares that she has received a Speaker Honorarium from Roche, Pfizer and Lilly. Dr. Paula Cabrera-Galeana declares that she has received a Speaker Honorarium from Pfizer and Novartis. Was obtain to review data that were collect as part of routine diagnosis and treatment following the ethical standards or the institutional research committee. This article does not contain any studies with animals or human participants performed by any of the authors.